PoPville » Friday Question of the Day – Favorite Family Recipe? Friday Question of the Day – Favorite Family Recipe? I thought I’d take this opportunity to ask others if they have any favorite family recipes they’d be willing to share? If you don’t have the recipe, I’d just be curious to know what’s your favorite family dish. My grandma made a mean French Onion Soup and my grandpa made a mean french toast. And we lost the french toast recipe and are still looking for the secret ingredient… What are your favorites? If you don’t like PDFs, you can check out Carlos recipe in full after the jump. “Prepare Marinade the day before, leave in refrigerator overnight. 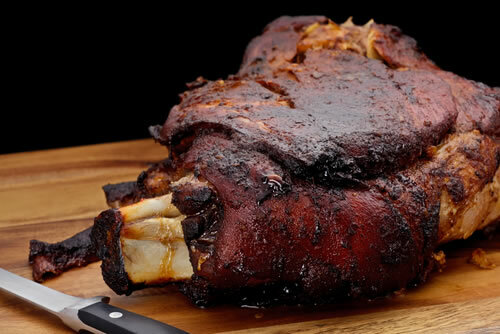 Begin by selecting a Pork Shoulder, Bone-in is better. You will need one plastic Oven Bag Turkey Size to Marinade only. Unwrap Pork Shoulder. Rinse under running cold water in sink. Dry with paper towels and set on cutting board. Crush and peel all the Cloves of one whole Garlic Bulb. with holes just large enough to insert Garlic Cloves tight. and place in Oven Bag. for each pound of Pork and place in Oven Bag. Naranja Agria into Oven Bag and stir. Carefully place Pork Shoulder with stuffed Garlic in Oven Bag. Carefully remove air from Oven Bag and tie at top. Place on a sided pan (should it leak) and refrigerate overnight. kitchen counter for one hour to bring up to room temperature. Untie. Carefully remove Pork Shoulder and place fat skin side up on Rack of Oven Broiler Pan. Preheat oven to bake at 500 degrees. Carefully pour Marinade into a container for Basting. as you seek to bake|roast, not to steam Pork. Place in oven for 20 minutes. Bring down to 250 to 275 degrees. 40 minutes for each pound of Pork, about 4 to 6 hours. Baste with Marinade every hour. Waft will take over the house. and roast without foil a few minutes. Watch careful not to burn. The sour Seville Orange Juice is indispensable to this recipe. Also, the Pork is inedible without the Salt. Oregano, Cumin, Onion Powder, Cilantro, Lime Zest and Ground Pepper separately. Spaniard Canary Island origin dating to the 1700s’. This savory roast may be the best Pork dish you will ever have. Plantains, and a Flan dessert with Cuban Coffee.